Samsung's QLED televisions have been one of the biggest talking points of CES 2017. The company's new Q7, Q8 and Q9 panels are said to offer a near-generational leap in picture quality and are poised to make QLED the next big thing in TV tech, alongside 4K, 8K and high dynamic range (HDR). 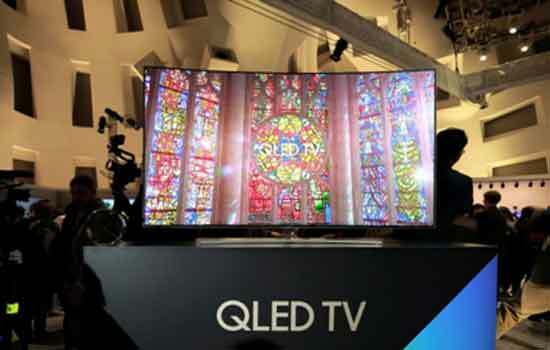 Despite this, rival manufacturers LG, Sony and Panasonic have stuck with OLED technology for their latest televisions. OLED is also reasonably new, with Sony only launching its first OLED television, the Bravia XBR-A1E, at CES on 5 January. So what's the difference between QLED and OLED, and which one is better? Here's a brief crash course to help you with your next purchase, or just keep you on top of the technical jargon. Many companies market 'LED televion' sets; these TVs use Liquid Crystal Display (LCD) pixel arrays that are illuminated from behind by LED lights. These illuminating LEDs can either be white, or in more expensive options, use RGB (red, green and blue) lights. OLED stands for Organic Light Emitting Diode - an advancement on previous generations of LED lighting tech using organic compounds. The short explanation is that this technology does away with the need for a backlighting system, as each pixel can be individually lit. This makes for thin, high resolution display panels that offer rich colour, contrast and brightness on a pixel-by-pixel basis, resulting in a more vibrant picture in general. QLED stands for Quantum Dot Light Emitting Diode. Quantum dots are highly conductive microscopic nanocrystals which, much like OLED technology, allow light to be supplied directly to each individual pixel in an LCD display, rather than having to rely on a backlight. While there are similarities between OLED and QLED in principle, the latter is an entirely different technology. Quantum dots emit coloured light, and the hue of the emission can be controlled by the size of the quantum dot structure and the amount of energy passed through it. This means the LCD display pixels can be illuminated with the exact colour of light they are visually repoducing. This also means that less energy is wasted on bright illumination where it is not required. QLED is purported to offer deeper blacks and much higher brightness than OLED panels, with luminance peaking at between 1,500 to 2,000 nits without impacting colour accuracy. In comparison, OLED panels typically top out at under 1000 nits. This theoretically makes QLED technology better suited for HDR, which demands a wide range of rich colours and accurate contrast. Early impressions suggest QLED is best-positioned to fully exploit the benefits of HDR and 4K content, which is poised to explode in availability in the coming years. QLED consumes less energy than OLED televisions, making them cheaper to own, and could also appear on the shelves with a lower price tag given that QLED televisions are cheaper to mass-produce than OLED sets. Although it's too early to say which technology will become the dominant standard in television design, first impressions of Samsung's QLED TVs have been overwhelmingly positive, suggesting that the South Korean manufacturer is on to something big. We'll have to wait until later this year when Samsung's QLED televisions arrive on the high street to find out for certain.